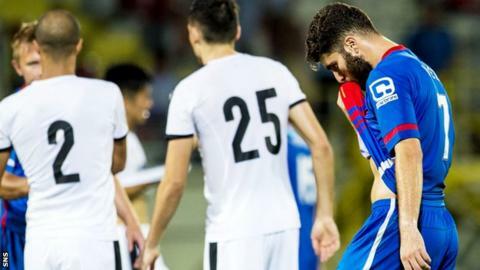 Inverness Caley Thistle's first European adventure is over after a draw allowed Astra Giurgiu to progress thanks to their 1-0 win in Scotland. Ryan Christie came closest to a leveller seconds before half-time when his left-foot shot from the edge of the box was tipped over by Silviu Lung Jr.
Constantin Budescu's 24th-minute first-leg strike secured the Romanians an aggregate victory. And it is they who face West Ham United in the third qualifying round. Inverness were composed in possession and produced a more than competent performance, with impact in the final third the crucial missing element for John Hughes's side. The tie was nearly over late on when Budescu went clear and, with all the time in the world, fired straight at Owain Fon Williams. It would have been a harsh end to a positive performance. An impressive band of blue-clad Highlanders occupied a corner of the stadium, enthralled at the prospect of their first opportunity to see their side away in European action. The sense many had prior to kick off was that this tie was far from over. Much of Hughes's thinking in preparation must have taken account of the sweltering conditions and, although some respite arrived with the fading sun, conditions were still taxing. Inverness settled quickly and were rarely threatened in the opening period, albeit they did not give the Astra defence too much to think about. Greg Tansey lashed a free-kick wildly over, while David Raven missed the target in similar fashion. Astra failed to impose themselves as an attacking threat. It was cagey, no-risk football that kept home supporters muted. A Doran header was held comfortably by Lung, but the sense was growing that the visitors could find a way through. The goal Inverness craved almost arrived just on the stroke of half time, when fantastic interplay released Christie, but the midfielder was left wincing as Lung did well to tip his shot over for a corner. Budescu had his first real sight of goal after the break, but the first-leg scorer's effort was scuffed and settled easily in Fon Williams's hands and the goalkeeper then tipped away the midfielder's powerful effort. Doran had perhaps the chance of the game when the ball fell to him eight yards out, but the winger's shot was rushed and bounced into the goalkeeper's arms. Inverness had to gamble and the tie was so nearly over moments before that when William curled an effort beyond Fon Williams but inches wide of his post. Budescu had the chance to kill the tie late on when clean through, but to the despair of the home fans he shot inexplicably tamely at Fon Williams. The European experience was over for Inverness, but it is an adventure they will look back on with fondness, if not wonder, at what might have been against a side they more than matched.